You know when you're trying to read an article on a website that's so busy that the content competes with the ads, the sidebars, the related links, the header and all the other noise? Yeah, that. Well, I recently discovered another fantastic tool from Evernote that is helping to maintain my sanity. Clearly is a browser plug-in that can turn off the noise. With a click of the little spotlight icon, a nice, clean tab wipes over the busy page and shows just the article. You can even customize the presentation, selecting the background colour, the font size and style. It makes for a personalized reading experience, no matter which site you are reading. It's probably a crazy easy plug-in to build considering that properly coded web pages come with <body> tags; so if they just isolate that content and ignore everything else, voila, easy to read pages! 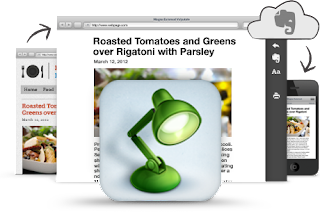 The other handy feature is that you can Evernote what you're reading with another simple click. Brilliant. Now, if you're not familiar with Evernote, you can check out my love letter post, Why I Can't Imagine My Life Without Evernote.